When I wrote Voters Not Politicians explains gerrymandering in Michigan last November, I was planning on following up soon thereafter. Instead, I just mentioned it six months later in Political reform for the seventh year of Crazy Eddie's Motie News with no update. I have one today, as WXYZ reported last night Michigan Supreme Court allows gerrymandering vote on November ballot. The Michigan Supreme Court ruled 4-3 on allowing Michiganders to vote on gerrymandering. If the ballot measure is passed in November, a bipartisan commission would be in charge of redrawing district lines. WOOD-TV had more in Last challenge to anti-gerrymandering initiative fails. When it comes to Michigan's legislative and congressional boundaries, there are few straight lines. Once again, as I've written before, "while WOOD-TV focused on expert analysis, WXYZ went with their strength, reactions from people on the street." This is one of the reasons why I subscribe to both stations on YouTube and why I try to use videos from both outlets on my blog. As befitting a newspaper, the Detroit Free Press included more details, including quotes from the ruling, in Michigan Supreme Court says let voters decide gerrymandering proposal. "Because VNP's proposal would leave the form and structure of the government essentially as it was envisioned in the 1963 constitution, it was not equivalent to a new constitution and was therefore a permissible amendment," the justices ruled in a 4-3 decision. Clement's vote to allow the proposal to remain on the ballot may hurt her later this month, as the Free Press observed Michigan GOP could drop support for judge over gerrymandering vote. 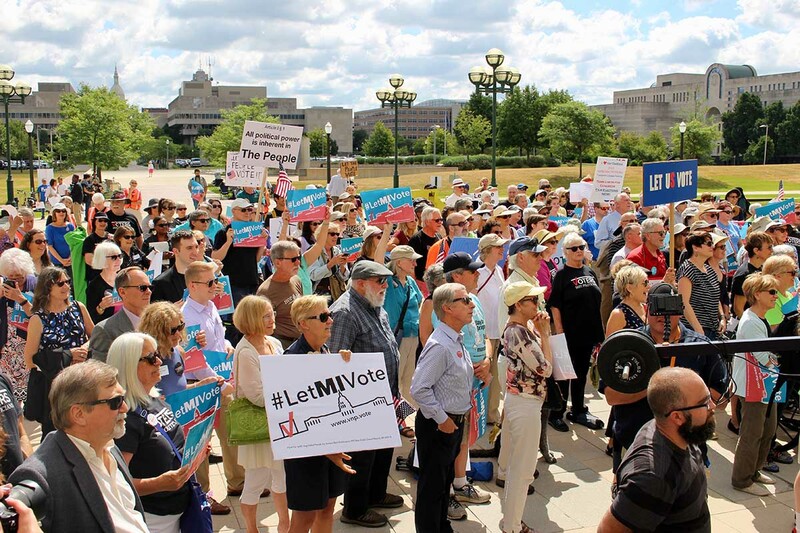 Will the Michigan Republican Party withdraw its planned nomination of Michigan Supreme Court Justice Elizabeth Clement at its August convention, as a rebuke for her vote late Tuesday to put an anti-gerrymandering proposal on the Nov. 6 ballot? Failing to re-nominate a sitting office-holder? The last time that happened, the Michigan G.O.P. replaced State Board of Education member Nancy Danhof with Todd Courser, who lost in November. If I were still a political reporter, that would be interesting to cover. That written, trying to replace Clement may not have quite the effect the conservative activists and delegates expect, as the Free Press went on to say "The Republican Party could nominate another candidate in place of Clement, though she would remain on the ballot as an incumbent justice." She would still be favored in November, so it would hardly be worth doing. That might not stop them. If the delegates at the Michigan Republican Convention actually do this, I'll write about it, just like I will continue to follow stories about redisticting and gerrymandering. Stay tuned.